Ivy League is located on 16 beautiful park-like acres. It is home to five playgrounds, and numerous small and regulation size playing fields and courts. Unlike a typical elementary or middle school which is limited to four walls, it resembles a college campus. The classrooms are distributed throughout the facility in various buildings. Each building is air conditioned to allow for comfortable learning on a year round basis. The gymnasium is a multi-purpose space which serves as an auditorium, cafeteria and gymnasium. The building has a movie screen and performance stage with lighting and sounds. The space is utilized for many other events, such as our PTO functions, student performances, art exhibits and assemblies. There is easy access from Route 347 to the south and Jericho Turnpike to the north. The school is located in a residential area and is set back from the road. Safety is germane to assuring a secure school environment. All visitors to the school must stop in the office and show identification in order to obtain a pass. All doors to classrooms are kept locked during the school day. There is a two way radio in every classroom, and monitoring cameras are located throughout the school grounds. 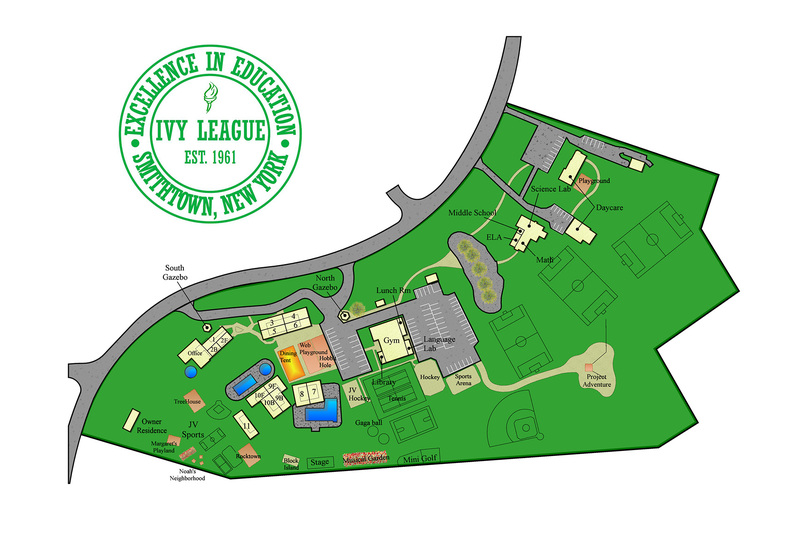 Ivy League School Map. Click image to download.